The Central Heights Community Cemetery is located just west of the intersection of Lauderdale Co. Rd. 81 and Alabama state highway 20. 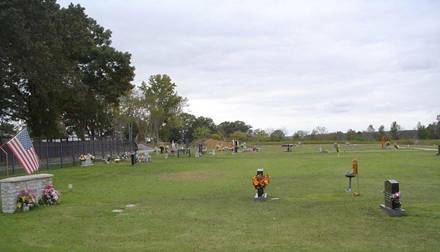 This is a relatively new cemetery with only approximately 38 graves. The decoration day at this cemetery is the 4th Sunday in June. There is one unknown grave here with no marker or information. Cromwell, Neat (Kelley); b. 23 Nov 1953, d. 17 Oct 2014, wife of James Sr.
Hale, Charlotte Jean; b. 21 Jul 1952, d. 29 Dec 2013, wife of Richard Sr.
Morris, James Floyd Sr.; b. 05 Sep 1940, d. 25 May 2012, husband of Betty W.